Aficionados of Coney Island—the legendary Brooklyn amusement district that enjoyed its heyday before World War II—often lament that they're too late to have seen the glory days, when the boardwalk games were smoking, the plaster mannequin Zoltar told fortunes and the Parachute Jump dropped shrieking visitors 250 feet to earth. The bad news is those days will probably never return. The good news is you can get a feel for them right now—online, courtesy of Nathan's Famous, whose original location still stands in the Coney Island neighborhood. Launching today and running to the end of summer is Ticket to Fun, a multiactivation campaign to commemorate the hot dog brand's 100th anniversary. The centerpiece of the campaign is a virtual Coney Island of yesteryear, an interactive, 3-D feature—compatible across all devices—that allows visitors to drop into the park, see the sights, ride the rides and play various games. 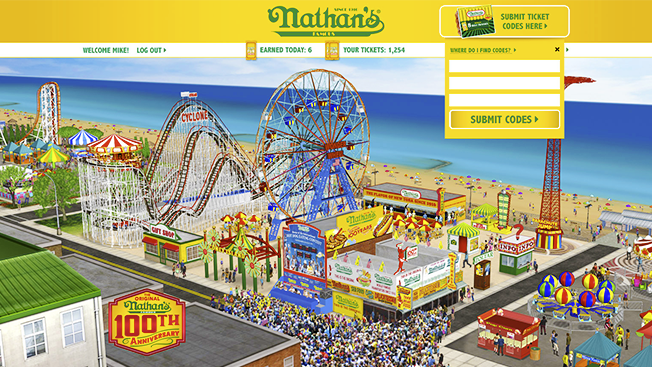 "You can ride the Cyclone or the Wonder Wheel, take the parachute drop and compete against Joey Chestnut in the hot-dog eating contest," said Mike Paribello, Nathan's senior director of marketing. "It's going to be incredible." It's also what Peter DeNunzio, CEO of digital marketing firm HelloWorld calls "an immersive, robust experience." And he would know. DeNunzio's company has been working on the virtual Coney Island since last fall. With an assist from Marsh Brand Partners, which consulted on the creative execution, HelloWorld devoted eight months and 30 staffers to creating the digital park. "It was a huge undertaking," said creative director Darrin Brege. Brege means creating a realistic Coney Island, of course, but also engineering a world designed to entertain visitors and encourage repeat visits, all while spotlighting the Nathan's brand. The virtual Coney Island features plenty of amusements. Virtual tourists can ride the swinging cars of the 150-foot Wonder Wheel and pop into a photo booth to upload a picture and customize it with hot dog stickers. They can even pay a visit to Zoltar, the bearded soothsayer who dispenses from a memory bank of 100 fortunes. In keeping with the Coney Island tradition, visitors can also try their luck at various games. For example, they can enter Nathan's Fourth of July Hot Dog Eating Contest, an event that's been drawing crowds since 1972, and face off against real-life scarfing champs Joey Chestnut and Matt Stonie. Hard-core Nathan's devotees can even play a game called Lunch Rush, which puts them in the role of Nathan's grill cook, stuffing buns and filling cups for customers who pop up at the window. "We were trying to create a lot of different aspects so it wasn't just one thing you can play," said HelloWorld's senior art director Nathan Sarlow. "We wanted to create something that's fun to interact with for one day but also have an ongoing challenge. So, you have games where you compete against everyone on a global leader board." Any brand appropriating Coney Island would be well advised to watch its step. The beery, greasy kingdom of rickety rides and salt air is actually a sacred place for many New Yorkers. But Nathan's has a legitimate claim to the turf. 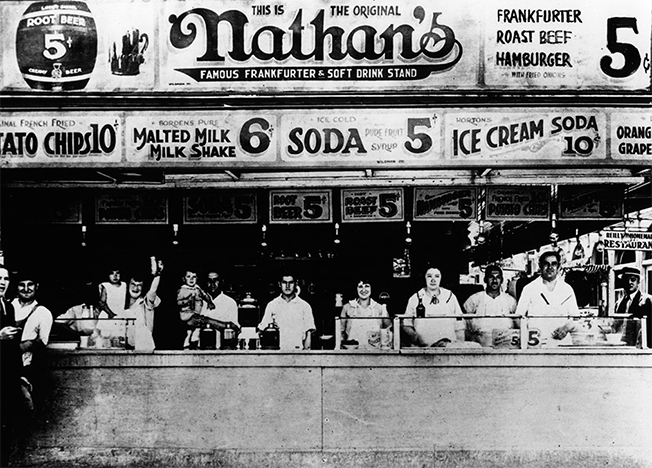 Polish immigrant Nathan Handwerker opened a stand on Coney Island's boardwalk in 1916 selling hot dogs made from his wife's recipe. Handwerker's dogs weren't the first on the boardwalk, but they soon became the most popular. Over the years, Nathan's fans came to include Al Capone and Jimmy Durante. President Franklin D. Roosevelt served Nathan's to the king and queen of England and brought some over to Yalta for Joseph Stalin. Nathan's has since grown into a corporate colossus. In addition to franchising some 300 domestic restaurants, the brand stocks its dogs in 50,000 retail stores and sold 480 million franks last year. But shipping packs of hot dogs is easier than shipping Coney Island. And that's the thinking behind the microsite. "We're bringing Coney to those who've never had the chance to grow up in New York," Paribello said. "We're trying to educate them—and it's legitimate. These are our roots and the authenticity of the brand. Hebrew National and Oscar Mayer—where are they? They're not a brand hailing from a real place. This brand has that authenticity and we can piggyback on it and bring it to life." DeNunzio said his company knew from the outset that if it wasn't done in an "authentic, realistic and credible" way, the project would be "a complete flop." "You're playing with people's years of Coney Island emotions, and if you violate those, it's a serious breach of trust," he said. The Coney Island faithful will no doubt notice that HelloWorld's creative team took a few liberties with the digital version. They rotated the Wonder Wheel 90 degrees, moved the Cyclone a few blocks to the west and the Parachute Jump a bit to the east, and even relocated Nathan's itself—a fixture on the southwest corner of Stillwell and Surf avenues—to a spot across the street. These changes, along with a generous sprinkling of Nathan's signage all over the park, were necessary to get all of the attractions into one square block. Plus, at the end of the day, this isn't history—it's marketing. 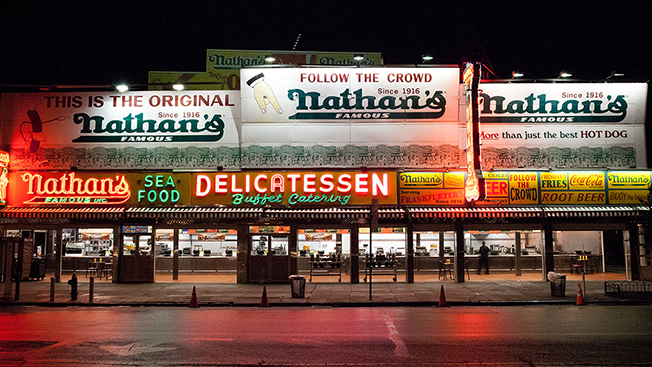 "It's the reason we call it Nathan's Coney Island," Paribello said.